Perhaps the perspective that both access to and use of technology automatically result in technology integration and the type of learning experiences described above has shifted and continues to be transformed on a larger scale than I realize. It seems a greater emphasis continues to be placed on technology integration and the need for supporting educators in implementing best practices for technology integration. The beauty of transformation is not only the accomplishment of the end goal but moreso to see the progress toward that goal. There is much work to do, but the work is so incredibly valuable. Thank you for continuing to be a voice for instructional best practices over mere use of technology. 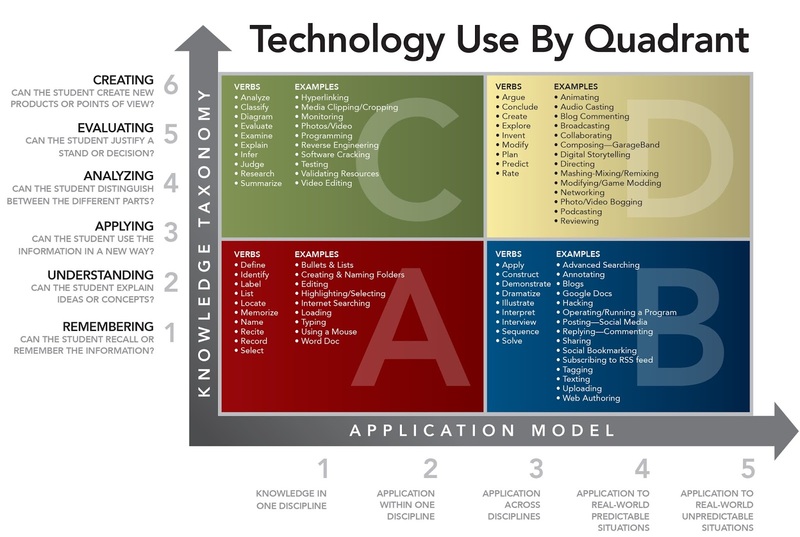 Eric, with due respect, I think that you blew it with your last graphic when you included technology tools in the quadrant. To even hint, for instance, that podcasting is (usually? often? always?) in Quadrant D while a Microsoft Word document is (usually? often? always?) in Quadrant A belies the fact that either tool can be used in both low and high level ways. You and I could quickly come up with all kinds of ways to use Word for higher-level learning - and all kinds of ways to make podcasts that were pretty low level. This is true for nearly all of the other tools listed in the four quadrants as well. Thanks for the comment Scott. The image in question is meant to provide some context as to how tools and resulting products can be used in specific ways to demonstrate conceptual mastery at a high cognitive level. The idea here is to get educators thinking a little bit about lesson design and learning outcomes. This is by no means a definitive statement that the listed tools are and can only be aligned to a specific quadrant. As you stated it is not the tool, but the outcome that matters and as such all tools can be used in low/high level ways. Thanks for pushing back. The nuance that you and I see isn't going to be there for most educators who look at the diagram (and who, let's face it, aren't very deep thinkers about their own tech use). Many are just going to say, 'Oh, look, I'm doing podcasting so I must be in Quadrant D.' I guess the question is whether you agree with me on this point enough to reconsider the diagram. I don't think you lose anything by taking the tech tools out and addressing them separately but I do think you run the risk of some serious conceptual and implementation concerns when you include them. I definitely agree with your point and feel that our discussion can only help to improve the glaring issue in our schools - the consistent ineffective integration of technology. I don't see it as specific tools being emphasized, but rather actions/products that can result from the use of certain tools. Let's take podcasting for example. If a student were to use Audacity to create a podcast that aligns to Quad D the hope would that he/she would evaluate/synthesis/analyze while applying it to a real-world, unpredictable problem (i.e. high level thinking). But as you have correctly stated, the action of podcasting can also be used in a total opposite way. I now need to think how I would change this diagram to hammer home the same point that we both agree on, which is the topic of this post. Great discussion about the Rigor/Relevance Framework. I think we do need a caveat, that the quadrant and the tool are not locked in, and much depends on the context and task. This is helpful as a starting point, when the majority time, Word is used to replace typical paper/pencil rather than truly increasing rigor/relevance. The dialogue that is generated is where the learning takes place for everyone. Thanks for bringing this to the forefront.